The Happy Standard is a light and spacious mobile home with a modern and welcoming layout, which makes you feel at home. This model has a double bedroom and a second bedroom with two single beds and a smaller drop-down bed only suitable for children (maximum 150 cm and 60kg). The seating area can be used as an additional sleeping area for 1 person. The kitchen has a fridge with a small chiller compartment, a hob with 4 burners, electric sockets and tableware for 6 people. The bathroom has a shower, a sink and a toilet. All the bedroom windows have mosquito nets. In the outside area, there is the garden furniture: table, chairs, two sunbeds. The Mobilhome is equipped with: covered wooden terrace / half covered wooden terrace / uncovered wooden terrace+parasol / awning / gazebo / parasol. Immersed in the Mediterranean scrub in the middle of a pine grove facing a soft sandy beach, Camping Village Paestum gives the opportunity to match relaxation with culture in an amazing holiday for your family. Paestum excavations and museum 10 km, Salerno 33 km, Amalfi 50 km, Pompei about 60 km. Campsite private beach 500 mt far, sloping seabed, equipped with parasols and sunbeds (at extra charge, €15,00/day). Bar, the beach can be reached by walking through the pine trees or by shuttle buses, available from the 1st of July to the 31st of August 2018. Pool with a slide for adults and pool for kids, with free solarium area on the grass, separate equipped area with sunbeds and parasols (at extra charge, €5 each, pool opening 15/05/2018-10/09/2018). Wide range of activities for kids and adults with mini club and junior club, evening shows, dance and musicals from 30/06/2017 to 01/09/2018, playground, soccer field, bowls, beach volley, basketball and volleyball, table tennis, games room, dance floor in the amphitheater, organized trip available. Restaurant-pizzeria with take away, bar/fast-food with an outdoor dining area, supermarket, bazar, newsagents, tabacconist, launderette available at extra charge, currency exchange, wi-fi zone (free of charge for 1 hour a day), nursing care from 1st of July to the 31st of August (available 24 hours a day), doctor available upon request. Cancellation / Deposit Refund The entire amount has to be paid within 45 days before arrival at the campsite. Cancellation of the trip gives the right to a refund consisting of the amount versed, minus the indicated penalties, for the inscription and the costs of cancellations services I.T. and individual reservations, which are: up to 45 days prior to departure 10% of the total amount of the inscription; from 44 to 15 days from departure 25% of the inscription fee; from 14 to 9 days from departure 50%; from 8 to 4 days from departure 75% of the fee; less than 4 days from departure no reimbursement is possible. Any traveller who decides to interrupt a trip, already started, will not be eligible for a refund. The persons named on the reservation must be the same arriving on site. In case of a name change please let Happy Camp know immediately so that they can inform the campsite. Children and Extra Beds € 2 - for each to be communicated at the time of booking. How far is the Camping from the beach?At 500 meters, the campsite's private beach with a sloping sea bed. The beach is equipped or free?Beach equipped with umbrellas and sunbeds (€ 15.0 per day for a fee), bar, you can reach the beach either by foot through a passage in the pine forest, or by the free mini-buses and guaranteed from 01/07/2018 to 31 / 08/2018. The pool is suitable for children?Swimming pool for adults with slide and swimming pool for children with free solarium on green carpet while the area equipped with sunbeds and umbrellas € 5.00 per piece, open swimming pools from 15/05/2018 to 31/08/2018. Entertainment/Mini club?Rich entertainment program for children with baby club and mini club and for adults with evening shows from May to September; table tennis and playground equipped with slides. How far is the village from the nearest city center?Santa Cecilia at 6,5 km, museum of Paestum 10 km. 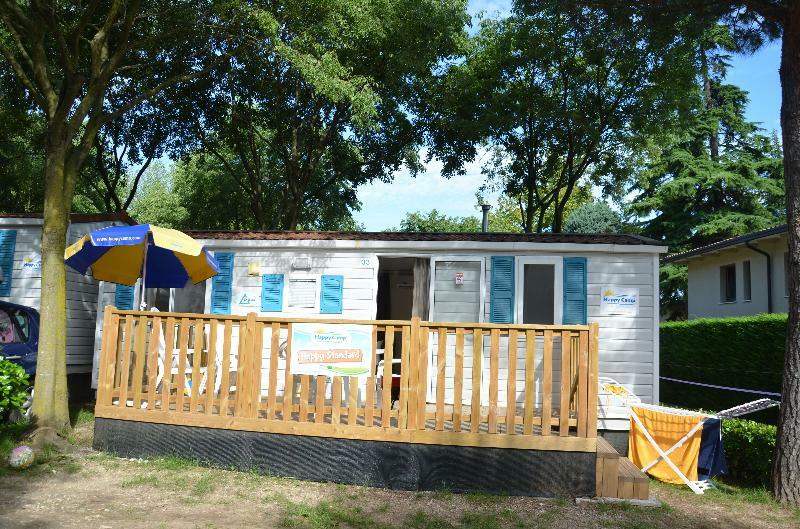 Accommodations are equipped with bed linen, bath linen and crockery?Bed linen to take home or to be booked at the time of booking or at least 7 days in advance of arrival at the campsite; Bath towels: beach towel purchased by the customer for a price of € 8.00 indicate when booking; crockery supplied in the mobile home. Accommodations are air-conditioned?Mobile homes with air conditioning (for a fee). Accommodations are equipped with TV?No. Final cleaning is included in the price?The final cleaning is charged to the customer, who will have to leave the structure clean and in order otherwise € 40.00 will be deducted for Happy Classic, Happy Standard, Happy Comfort, Happy Tent and Happy Maxi Tenda / € 50.00 for Happy Premium and Plus types; Happy Camp does not provide cleaning services. Cancel/Confirmatory deposit:The entire amount has to be paid within 45 days before arrival at the campsite. Cancellation of the trip gives the right to a refund consisting of the amount versed, minus the indicated penalties, for the inscription and the costs of cancellations services I.T. and individual reservations, which are: up to 45 days prior to departure 10% of the total amount of the inscription; from 44 to 15 days from departure 25% of the inscription fee; from 14 to 9 days from departure 50%; from 8 to 4 days from departure 75% of the fee; less than 4 days from departure no reimbursement is possible. Any traveller who decides to interrupt a trip, already started, will not be eligible for a refund. The persons named on the reservation must be the same arriving on site. In case of a name change please let Happy Camp know immediately so that they can inform the campsite. Children and extra beds:€ 2 - for each to be communicated at the time of booking.